It’s summer. It’s hot. It’s humid. Who doesn’t want ice cream every day??? But oh my, I don’t want to know what my bathing suit would have to say about that! I’m so excited about my find I included three amazing recipes in this one post. Easy to make, guilt-free and so refreshing, I hope you enjoy, my friends! 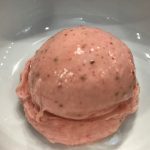 Creamy, guilt-free Strawberry Banana Frozen Custard! A healthier ice cream option opens doors for many of us…those of use who are dairy-free, egg-free, or vegan. Or those of us whose clothes, sugar or cholesterol counts sadly won’t allow us to indulge in ice cream on a regular basis. 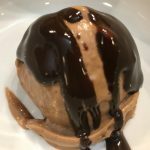 Top Chocolate Banana with Killer Dairy-free Fudge Sauce! A dear girlfriend of mine from high school returned from a vacation at the Jersey shore and she told me about a place that sold fruit based frozen custard, and how delicious it was! I had to explore this further. I began playing around with different fruit combinations, and so far the ones below, Banana Mango, Banana Strawberry, and Chocolate Banana, are my favorite. They are easy and fast to make and have very little added sugar. 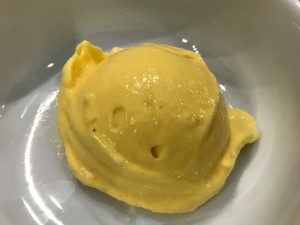 Fruit frozen custard allows you to indulge in a cold, sweet, creamy treat without all the sugar, dairy, and calories of ice cream. That’s why it’s called “n’ice cream.” It’s sooooo nice to you! Banana Mango Frozen Custard "N'ice Cream"
Chop banana freeze in chunks. I keep frozen chopped banana on hand in the freezer for smoothies and frozen custard so it's ready when I want to make it. Chop mango and freeze in chunks. You can buy frozen mango. If you do, let it sit out for 15 minutes before putting in food processor because it tends to be really frozen and hard (compared to fresh mango). 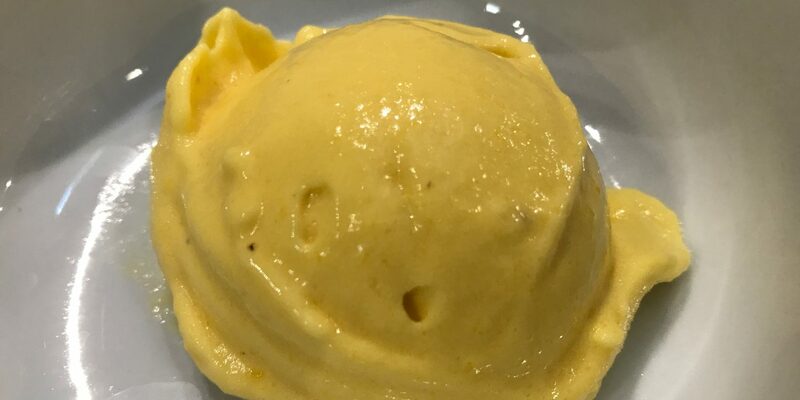 Put frozen banana and mango chunks into a food processor with rest of ingredients and blend until smooth and creamy. Eat immediately for soft serve or freeze for harder ice cream. Strawberry Banana Frozen Custard "N'ice Cream"
Chop strawberries and freeze in chunks. You can buy frozen strawberries. If you do, let them sit out for 15 minutes before putting in food processor because it tends to be really frozen and hard (compared to fresh strawberries). 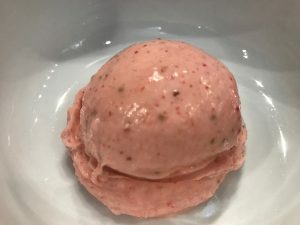 Put frozen banana and strawberry chunks into a food processor with rest of ingredients and blend until smooth and creamy. 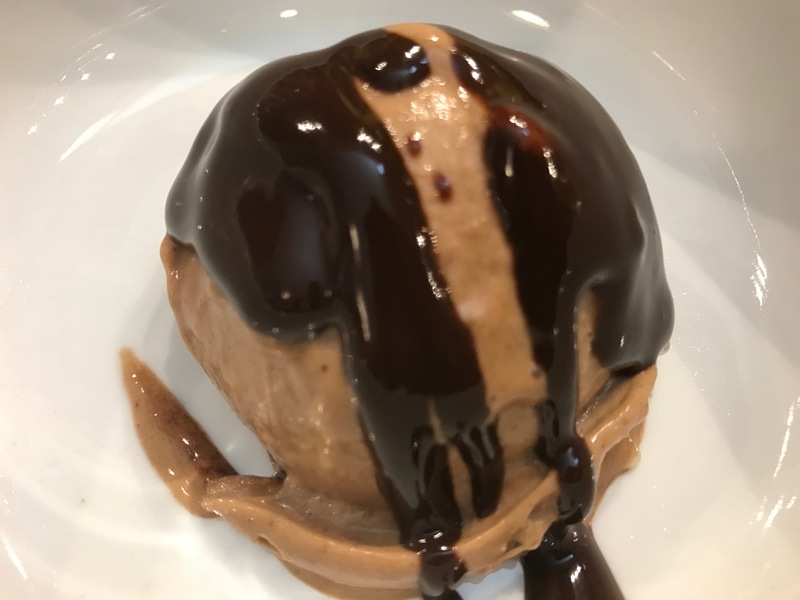 Try topping Chocolate Banana Frozen Custard with a little Killer Dairy-free Fudge Sauce! Slice banana into chunks and freeze. Put all chocolate sauce ingredients in a blender or food processor and whiz until blended. Pour into an airtight container. Set aside. Once banana is frozen put into a food processor with rest of ingredients and blend until smooth and creamy.